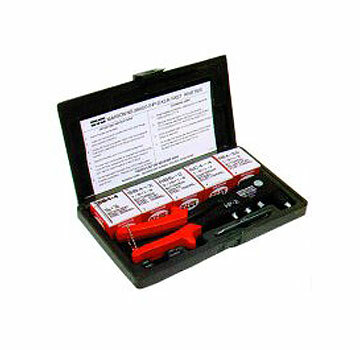 PRODUCT: ALCOA MARSON 39001, "200 KIT". INCLUDES HP-2 PROFESSIONAL HAND RIVET TOOL, 200 KLIK-FAST RIVETS IN 5 POPULAR SIZES, AND A DURABLE MOLDED PLASTIC CASE. HP-2 TOOLS SETS 3/32 to 3/16" DIAMETER RIVETS IN 1/8" to 5/8" THICKNESSES MATERIAL. (Marson brand is now under Alcoa, Inc). HP-2's square shoulder fulcrum pin of cold-formed heat treated steel prevents pin rotation that can elongate the engaging holes and cause premature tool failure in imitation tools.